It’s been a long time since we last wrote anything for The Octant. We do not even remember what the last article we wrote was. But we remember the first piece of writing. It was an Editors’ Note introducing Panopt, the Vice-Rector’s new academic newsletter, and ourselves. There was a picture of us, taken hastily with an iPhone along the windy corridors of Residential College 4 (RC4), our old home. Four years on, it only seems appropriate that the last article we co-write is once more, a letter to you, our readers. First, allow us to reintroduce ourselves. We are Joyan and Spandana, the founders of what you now know as The Octant, and (almost) antiquated seniors on the cusp of graduation. As adulthood beckons, nostalgia begins to set in. So indulge us as we tell the story of how The Octant came into existence. We promise there will be drama, conflict, and controversy. The Octant didn’t always exist in this form. In our freshmen year, you might even say that it didn’t exist at all. Instead, there was a Vice-Rector’s Academic Newsletter named Panopt from the only Vice Rector then, Dr. Eduardo Lage-Otero. Both of us worked with him and Indrani Kaliyaperumal from the VR’s Office to produce weekly copies of the newsletter, covering activities and events in the college, and encouraging contributions of all genres from students and faculty. As freshmen year drew to an end, we sat down to talk about the future of Panopt. A couple of our friends had commented that they would like to read more student opinions on important issues and that our content wasn’t always very engaging (ouch!). This feedback came after weeks of waiting by the printer and painstakingly pinning up newsletters from levels 9 to 13 in RC4. We wanted to remain relevant to the community and we realized that staying as an academic newsletter just wasn’t going to cut it. It was time to regroup. 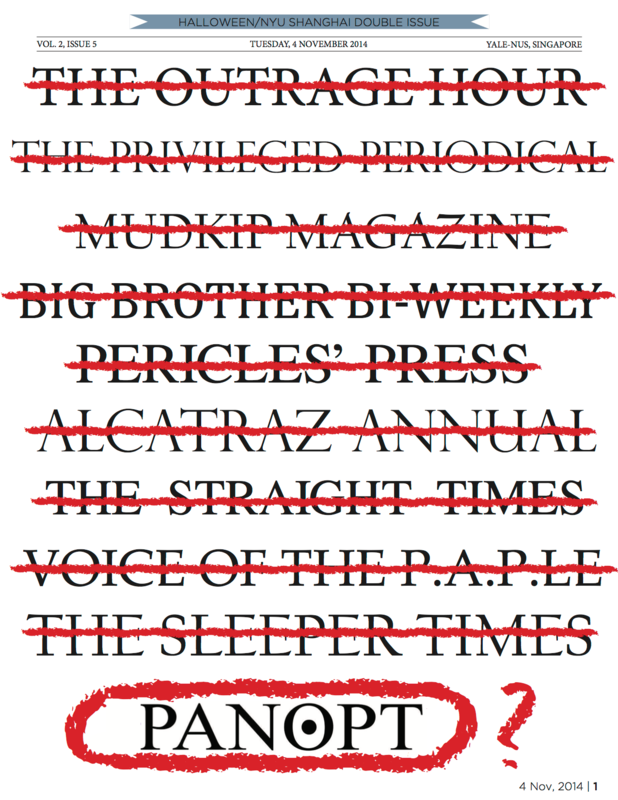 We frantically reached out to anyone who could put us in touch with editors of college newspapers around the world, followed by several bleary-eyed Skype chats and email exchanges with editors at the Yale Daily News, the Brown Daily Herald, the Dartmouth Daily and The Gazelle. Armed with information about different recruitment, distribution and operation models, we took a stab at creating a tentative structure and plan for a student newspaper. From a two-women team, we expanded to a team of 14 that included sports writers, features writers, news writers, opinion editors, designers, and a business and distribution role. We could not wait to get started on our new mission as an autonomous student publication. Initially, we thought that the key challenges would involve how to fill up and put out a four-page issue weekly that was engaging to our readers. We did not anticipate some of the challenges that we eventually faced. We began publishing more controversial articles, like What are we playing for—an article by Raeden that questioned our ties to the National University of Singapore (NUS). Students who had previously been accustomed to our relatively harmless columns like Know Your Professor and Writing Tips were taken aback and immediately raised their concerns with us. We received questions such as, “why bite the hand that feeds us?”, and (not so) friendly advice about how we might negatively impact the school by offending key donors with our articles. Those days were tough ones. We frequently received emails and Facebook messages minutes after publishing an issue, questioning our editorial decisions and demanding that we recall particular articles that expressed overly sensitive or controversial sentiments. We would hold midnight meetings in Joyan’s room comparing reactions we had received and trying to figure out what the best course of action would be. We are quite proud today to say that we never recalled any article, no matter how controversial or sensitive, but instead encouraged dissenters or those who felt strongly about the topic to write in with their opposing opinions. We wanted the paper to be a platform for different opinions, no matter how controversial, and it took some time for us and the community to fully internalize that motto. Another unexpected challenge we faced was the strong objection to our name, Panopt, and demands to change it. To cut a long story short, we published a guest opinion piece, arguing that the name Panopt had connotations of the Panopticon, an all-seeing prison system coined by Michel Foucault, and that the college paper should not portray such a negative perception of the college to the wider public. The view gained traction and soon the issue had seen a number of Facebook debates, a controversial cover, a petition calling from a referendum on the name, which gained 63 signatures, and a rather unpleasant forum. Ultimately, we decided as a team to refocus on our core mission and rebrand the publication, eventually reaching the name you all now know—The Octant. The cover of Panopt, printed in response to the controversy. The very next semester, we launched a collaboration with the Yale Daily News where we pooled resources and launched reporting projects together which were then published in both our papers. This collaboration helped us dispel many misunderstandings that had circulated about Yale-NUS College during the launch of the college, and we were glad to see that reporting about the college in both national and international news sources reflected the college’s issues more accurately and became more nuanced moving forward. No story of the roots of The Octant would be complete without acknowledging the countless readers who faithfully read our work, offered constructive criticism and encouraged us to keep pushing our boundaries. While we cannot name everyone who shaped this paper in the early days, we would like to thank two individuals in particular. We are deeply indebted to Vice Rector Eduardo Lage-Otero who inspired us to create a newsletter and remained a trusted advisor through our most turbulent times. We would also like to thank President Lewis, who set a precedent for staff and faculty members at Yale-NUS by making himself available to our reporters, no matter how critical our coverage. For that, we remain grateful. … And we’ve rambled on for long enough by now. Having seen The Octant go through two successive Managing Boards after we left the organisation, we’ve been very heartened to see how much it has grown. The times when our reporting inspired the Straits Times or other international news sources are a testament to how far the paper has come from its early academic newsletter days. Thank you readers for reading the story of our roots and where we begun. It’s been a blast and we couldn’t be prouder to leave the organization in the capable hands of the next Managing Board. It’s time we moved on to our next great adventure. Joyan Tan ’17 and Spandana Bhattacharya ’17 co-founded the paper as an academic newsletter in October, 2013 and served as editors until May 2014. They then reimagined the newsletter as an autonomous student publication and served as its Co-Managing Editors from August–December 2014. From January-May 2015, Joyan served as Editor-in-Chief while Spandana served as Editor-at-Large, and Spandana served as Editor-in-Chief from August 2015–May 2016.